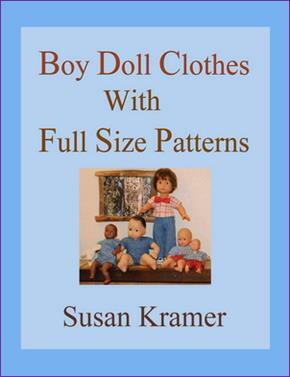 Full size patterns for clothes to fit popular brands of 18-18.5 inch (45-46.5cm) boy dolls like AG Logan and Gotz Parker; 14 inch (35cm-40cm) medium baby boy dolls like AG Bitty Baby, and Gotz; 12-13 inch (30-32.5cm) small baby boy dolls like Corolle Calin and Kathe Kruse baby dolls; 8 inch (20cm) boy mini baby dolls like Gotz Mini-Muffin; and my fabric 12 inch (30cm) bunny doll body and vest pattern. Instructions are given in inches and centimeters. Patterns are ready to use. Photos of finished outfits and an appendix of doll body characteristics and measurements are included, plus instructions to make a fabric doll belt, and a doll bow tie. Front cover shows a selection of finished doll outfits from the full size patterns. About the author - Susan Kramer has been teaching meditation, yoga, dance and academics kinesthetically as a dance specialist since 1965 and maintains a large educational web site at susankramer.com. Her crafts include sewing, quilting, and doll designing. Content copyright Susan Kramer 2017. All rights reserved.